(From Nikon lens literature) Nikon Inc. has announced the latest addition to its legendary NIKKOR lineup, the new AF-S DX NIKKOR 18-300mm f/3.5-6.3G ED VR telephoto zoom lens. Designed for the DX-format photographer looking to get more out of their D-SLR camera, the versatile NIKKOR 18-300mm is a compact and lightweight 16.7X all-in-one telephoto zoom lens that delivers high performance and superior image quality. Whether capturing still images or HD video, the 18-300mm lens is built to help users capture content with vibrant colors and sharp details, plus shoot sports, vacations and wildlife with confidence. I've now taken hundreds of shots with my Nikon D7100 to compare the A. 18-300mm f/3.5-6.3G DX with B. 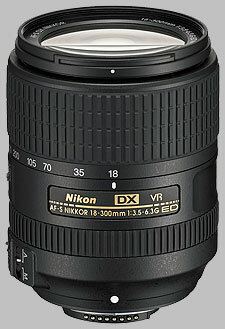 18-140mm f/3.5-5.6G DX and C. 70-300mm f/4.5-5.6G FX, chosen best of three in all categories and carefully compared them. 1. There's bothersome vignetting at 18mm with A, notably more than with B. 2. Focus breathing with A is unacceptable at 300mm from closest focus to about 10 feet; it drops off quickly after that, as well as with lower focal lengths. 3. At all focal lengths, subjects at 100 feet to several miles away, A and C are identically sharp. If there's any difference at all, I couldn't see it. 4. Ditto, last in respect to contrast. C is supposed to lose contrast at 300mm. But if it does, so does A. I see no difference. They're both good at 300. 5. B is much sharper than A with close subjects, i.e., about 6 feet away, at each focal length; with more distant subjects, they're more similar, but B is still sharper. 6. C auto-focuses more reliably than A at 300m with a Kenko 1.4x teleconverter. It's a matter of f/9 v. f/8; that small aperture difference seems to matter. 7. Distortion is bad with A at all focal lengths, except from around 24 - 35mm (35 - 50mm FX equivalent). The D7100 in-camera distortion control works pretty well with RAW images from A, but not as well as with B. With A at 18mm, DC isn't very good, so residual barrel distortion needs post-processing. A. Nikon has tried to do what probably can't be done with today's technology: Produce a lens that is very sharp from 18-300mm with easily controllable distortion. B. A seems to be an upgrade of the 18-105 f/3.5-5.6G DX, which is inferior to B. I have owned them both and got rid of the 18-105. C. I would only recommend A to someone who doesn't have other Nikon lenses and wants to cover the 18-300mm range with one lens. It's perhaps okay for that. If someone is willing to use B and C, they can be picked up at virtually the same total price, and offer more utility and flexibility. I would not buy it. D. Overall, I would rate A at 7.0 on a scale of 10; not even 8, as I think it's drastically over-priced. A USA model, new, should sell in the $600-650 range. E. At 300mm the lens zooms out so far that I'd worry about damaging it with even a slight tap against something out there. F. Finally, I rented A hoping to like it and eventually to buy one. I now have no intention to buy one, even when they become much cheaper, which they will when the news spreads.